AirCrete was new to me up until a few months ago. Have searched around to get better educated about this building methodology. Struggled with investing in the equipment to make some test blocks. Think others have similar struggles. Have recently moved through that struggle and wanted to share a simple way for anyone to make test blocks too. 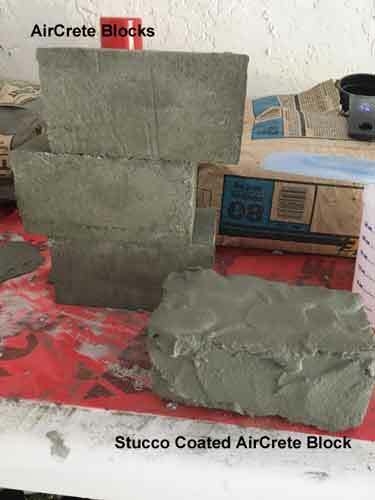 Am new at making AirCrete blocks but did have an idea for those who do not have the equipment and wanted to get started right away making sample AirCrete blocks and gain confidence in this great technique you have shared with us. Easily making these test blocks has really opened up my understanding of the incredible possibilities we can achieve with this building methodology you have shared with us! Thanks so much to you and your team, the world is now a much better place! Thanks, that's a great intro to making AirCrete! Great PDF! Thank you FoamAir for the walkthru. We are equally excited about this material and its potential for long-lasting, economical, and beautiful housing. Seems like we are using the proper ratios based on what you mentioned in the PDF which matches up with what is described through Domegaia's videos and website. I suspect the issue might be with our well water source so we are going to try again using the Seventh Generation dishsoap with Reverse Osmosis filtered water from our food co-op in the little dragon. Also! In addition to that test, we ordered a bottle of the Drexel Foam Concentrate from RuralKing.com as recommended on Domegaia's Foaming Agents page. We are very exctied to see how this performs as it is highly recommended on Domegaia's Foaming Agents page. The volumetric ratio between (Water):(Seventh Generation Soap) is 35:1 as posted on Domegaia.com. 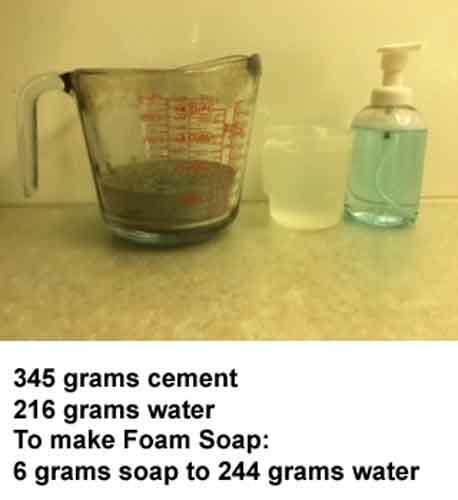 For the (Water):(Drexel Foam Concentrate) it seems that the ratio might be 160:1? What ratio would you recommend for the (Water):(Drexel Foam Concentrate) to make AirCrete? We finally have our Little Dragon supplying beautiful aircrete. Turns out the issue was the water quality. We were using well water which for whatever reason was reacting with the foaming agent (seventh generation soap) and causing a reaction which collapsed the bubbles. I went to our co-op and filled up a 5-gallon jug with their reverse osmosis water station and voila! The collapsing weak aircrete we had known from previous testing became an entirely different material altogether, thick, viscous, holding its shape. Beautiful. Just like the videos. I would like to mention that I had a hard time finding any information regarding water quality and its effect on aircrete. I think that this should be mentioned on the front page of the little dragon, it took us a few months of testing to overcome this obstacle and it would be nice to save others the trouble! Thanks Levi, I didn't realize that water quality is so important. I guess we've been lucky with our city water supply. I wonder what it is about the water that makes a difference? I haven't found it mentioned as an issue in my research. If any one has information about the importance of water quality, please let us know. Thanks! @hajjargibran Look into "structuring"- meaning- erasing the memory of the water. Dr. Emoto did research on the quality of the water. He found that all water has a memory to it, so what if structuring it would fix any issues with the water? Or just use a reverse osmosis system. Here are a couple links about structured water. I personally have a small water structurer. I have found it to work fantastically for me. We have hard well water. If/when we begin using aircrete, we'll let you know if we experience the same. @FoamAir I followed this recipe with my own foam that weighs 85g / ltr made with reverse osmosis water and 7th gen foam. My slurry seems thinner and runnier than yours but maybe that is the pictures not showing up well. Also, there is sand sitting in the bottom of the mix. The cement mixes but there is sand at the bottom in the slurry and after the foam is added as well. Did you have a bit of sand sitting at the bottom too? I have formed it and can hear my foam reacting one in the form, it is gassing off and collapsing. I will go buy a small foamer and try. I have Drexel on the way. This is all with reverse osmosis water, foam and slurry. Thoughts? @chuckj sand? Portland cement has no sand. Are you using the correct cement? @HandyDan hi. Yea I was wondering if I was using the wrong mix. I am using concret mix. 10.5lb bag of quickrete. So it is a mix of cement and aggregate. Wrong stuff I guess. No wonder. I have anothe idea too. I am going to mix in crusaded scoria (lava rock) to add strength and still give good insulative value and light weight. Off to get the correct mix now :). Thanks!! Experiments are great. However, it will not be true air-crete and will cost more. My first test batch did something similar, I lost an inch or two after an hour, before it could set up. I'm using the drexel soap. I weighed it and it was in the proper range. I thought it was my mix at first because I calculated out a 5 gallon bucket test run. But then I noticed the test foam on the ground had deflated too by same amount. My thought is the well water is effecting the soap, in my case, our well has a lot of rust from old well pipe removed years ago. Could also be inorganic mineral salts in the water. Glad to hear that cleaner water worked for you, I am by a river and will have to test if that water will keep the soap foam stable better than the well water. One other note, I do have a coarser stainless scrubby in my tube, not sure if that would matter? If anyone wants to know if their water is good, just make some test foam and let it sit around for an hour or so and see how stable the foam stays. That will be my next test before another batch. "There is a critical salt concentration above which the salt acts as a defoamer." "We report unexpectedly strong ion-specific effects of counter-ions on the stability and the rate of drainage of planar foam films from solutions of 0.5 mM sodium dodecyl sulfate (SDS) as a function of concentration of a series of inorganic salts (MCl, M = Li, Na, K). We found that the counter-ions can either stabilize the foam films (up to a critical concentration) or destabilize them beyond it." I'm just about to make my very first test block. Came here looking for how much foam to add to cement slurry. I made my own foam generator and tested it using Dawn Ultra. However, I too have a well water here in Florida, USA. My first foam test made lots of foam but it did seem to collapse rapidly. But here at my house I harvest rain water off my roof! Rain should be free of any hardness and minerals. And it is free and readily available to me. I generally use it for my garden and greenhouse. So I'm about to go out to my garage and try the cement slurry and the foam mix with rain water. Seems to me easier than going to buy distilled water. Okay, I'm finished making my very first test block of AirCrete! First I measured 1/2 gal US of water from my rain barrel in plastic pitcher I use for iced tea. After weighing it on my kitchen scale just to be sure it was about 4 lbs I poured it into a 5 gal bucket. At this point I would like to apologize to those readers who are on the metric system. I can and do use metric, but all my utensils are imperial. Next I weighed out 8 lbs of type I-II portland cement from the 94 lb. bag I bought yesterday from a local Home Depot store for $9.20 and put it aside. Then I measured another 1/2 gal of water from my rain barrel and mixed 1 Tbs (tablespoon US) of Drexel F.M.-160 foam / marker concentrate I purchased from local Rural King store. 1 gallon cost me $22. The directions said mix 1 gallon with 160 gallons of water. Apparently it is used in large sprayers for pesticides on crop fields to mark where the spray has been dispensed. The container does not say what the active ingredients are. Only that they are exempt under CFR-40 (code of federal regulation). However, because it will be stabilized in the cement when it sets I feel it is not an environmental issue. And more over it is used on crop fields so hopefully our government is making sure it is not toxic. Next I mixed the cement into 5 gallon bucket with the ½ gallon of water using an electric drill with a joint compound type paddle mixer. After that I started my compressor and poured the foam concentrate mixture into my foam generator and connected the air hose and started shooting the foam into the bucket of cement slurry, all the while using my other hand to run the drill and mix the foam into the slurry. It was awkward but I managed. I added foam until the bucket was almost completely full and then continued mixing it with the drill until it was uniform texture. At this point I should mention that I have been doing construction for over 40 years and 30 years of it included building concrete forms and tying rebar and pouring and finishing concrete. So when the Aircrete mix was finished I braced myself and grabbed the bucket. I couldn’t believe how light it was! Previously I had built a 16 in. square form from wood and I now filled it up which took the whole bucket. So now I am just waiting for it to set up. I didn’t caulk the formwork but only screwed it down to a piece of plywood I had in the yard for a base. It looked pretty tight. But as I was admiring my work I saw some but not a lot of the cement leaking out. My whole purpose of doing this is to prepare for making preformed slabs about 4 inches thick and 2 feet wide and 6 or 8 feet long to use in setting up a raised-bed garden. Instead of stacking blocks I will just set these on edge and fill them with mulch and compost. Good luck everyone and safe voyages! PS. I'll give an update later when it is set and hard and try to upload some pictures also. It is now the next morning and my test block is still not set hard. I can poke my finger right into it. I am thinking I used too much foam. I am going to give it another day to set. This morning I gently poured water on it and covered it with plastic sheeting to help with the cure process. Hopefully it is not the foaming agent that is retarding the cement. As for the bubbles collapsing I did not observe any. And it is surprising because it stayed wet a very long time. I have a picture to upload but I am not sure how to do it. PS. my apologies for the previous post that published in mixed colors and dark background. Not sure how that happened and I have not been able to remedy it. @leroy That is a good thing to know when making those blocks Thank you very much.